In Schools, Colleges and offices social networking sites like facebook, twitter, Google+ and youtube are mainly been blocked so that the person don’t get too much indulge in his online social life and neglecting the things that matters a lot like completion of project in a given timelime, meeting with the people in real world , exploring new things that gives boost to your productivity and creativity. But we sometimes need a break from our hetic lifestyle and are curious to know whats going in our friends life as everybody rather calling, texting are simply updating there facebook status and are uploading videos on youtube “How awesome there trip was ” and in that scenario we are helpless as we are blocked from using social networks. Most of academic institutions block such websites using some software or by asking there ISP to block all the sites listed. How they block sites is the least of our concern as we are going to unblock anyway. 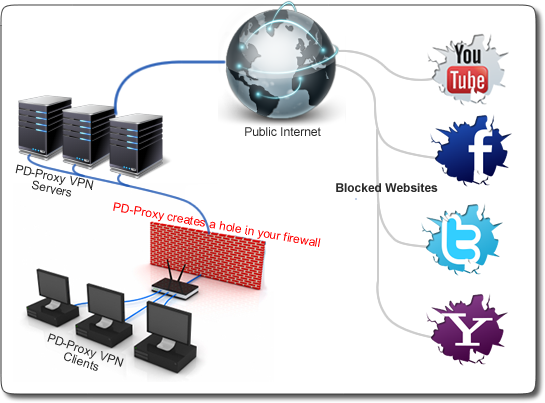 2 step : You need to download PD-Proxy one of the best VPN tunneling software that makes a secure connection by encrypting all your internet connection. 4 step : In server & Protocol Select Either Demo Server 1or Demo Server 2 which servers are hosted in US. Connect using any of 3 modes : UDP, TCP and ICMP. That’s it after you have connected to pdproxy you can now any of the social networking sites which are blocked by your ISP and you can Hulu.com which are only accessible from US as proxy changed your IP address. PD Proxy demo accounts comes with its own limitation like you cannot use more than 100MB bandwidth a day. To overcome this limitation you can buy PDproxy premium account for 1 month only at $4.99 .